NEW RECRUITS FOR THE 2018/2019 TRAINING YEAR BEGINGS ON SEPTEMBER 4th, 2018! 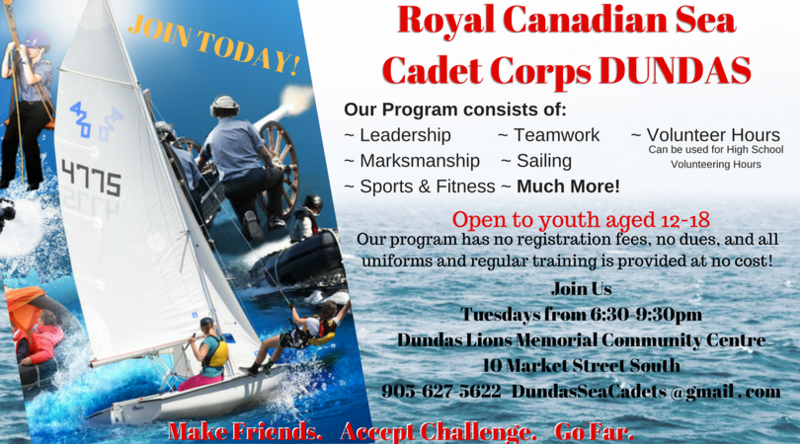 Interested in joining the Dundas Sea cadets? Come and be a part of our 75th anniversary! but you have to be 12-18 years of age to get in on the action!!! There are no registration fees or dues to join the Cadet Program and ALL youth aged 12-18 are welcome. We encourage you to con﻿tact us if you have any questions, comments or would like to join us! CADETS: Are you planning to attend university or college in September? You may be eligible for a Royal Canadian Sea Cadet Scholarship. Click the Scholarship link under CADET RESOURCES tab for more information. Dundas Valley Golf and Curling Club. Click the ALUMNI tab for more information. After undergoing a rigorous selection process, a once-in-a-lifetime opportunity has been awarded to a 16-year old Dundas Sea Cadet. Chief Petty Officer Second Class Daniel Neiterman is one of 12 Canadian Sea Cadets to practice his sea skills aboard the TS Royalist, a tallship based out of Plymouth, United Kingdom, as a part of a three week training opportunity. The square-rigged tallship will take a 12-day voyage from Gosport, UK, through the River Thames to the English Channel to the Northern Shore of France. Chief Petty Officer Second Class Leah Guffroy was presented with the Royal Canadian Legion Medal of Excellence. The medal is presented for exemplary community service and citizenship, as well as high participation within the cadet unit. The medal presentation was done by Royal Canadian Legion Branch 36 Cadet Liaison Officer, Mr. Rick Valois. See the link below for the story in the Dundas Star! On Saturday November 10, 2018 at 11am, the Sea, Air and Army cadets of the Dundas area began a 24 hour Vigil, in honour of Remembrance Day. Over the course of 26 hours (including the Remembrance Day Parade and Service), over 70 cadets spent time honouring the fallen by standing guard at the Dundas Cenotaph, in front of the Dundas Lions Memorial Community Centre. The temperatures were quite cold over the night, but the cadets remained strong for this meaningful event. We would like to thank all of the citizens of the town of Dundas who stopped by to Thank the cadets, honked their horns as they drove by, dropped off hot chocolate and snacks, or sent us messages of encouragement via Social Media. Two members of the Dundas Sea Cadets were recently presented with medals for outstanding performance and contribution to both the program and community. Chief Petty Officer First Class Michael Harris was presented with the Lord Strathcona Medal. The medal is the highest award that can be bestowed on a cadet, in recognition of exemplary performance in physical and military training. Petty Officer Second Class Dylan Meade was also presented with the Royal Canadian Legion Medal of Excellence. The medal is presented for exemplary community service and citizenship, as well as high participation within the cadet unit. The Sea Cadets for RCSCC DUNDAS and RCSCC IRON DUKE teamed up for a training weekend based around the Battle of the Atlantic. After a day of drill, guard and colour party practice, and ironing their uniforms, and polishing their boots, the cadets participated in the Burlington Battle of the Atlantic Parade, at Spencer Smith Park. Learn more about some famous Canadians who were once a part of the Canadian Cadet Movement by clicking HERE! 2018 marks the Sea Cadet Centennial! This year, one cadet per unit was presented with a limited edition Collectors Coin, serialized with the Unit Number on the back. The cadet was chosen by the Commanding Officer of each unit, and presented at their 2018 Annual Ceremonial Review. Bravo Zulu to PO1 Johnnathan Gershkovich for receiving this honour! After undergoing a rigorous selection process, a unique and once a life time opportunity has been awarded to a seventeen-year-old Dundas Sea Cadet. Petty Officer First Class Annie Billings, will be travelling this weekend to British Columbia to participate in the Sea Cadet Seamanship Deployment at Canadian Forces Base Esquimalt. Annie ...and other cadets, selected from across Canada, will train aboard the Royal Canadian Navy’s Patrol Craft Training vessels RAVEN and CARIBOU between Oct 14-21, 2017 The ship will operate in the Juan de Fuca Strait, Gulf Islands and Strait of Georgia (coastal BC and Vancouver Island). “The Cadet Program has taught me leadership, teamwork, instructional abilities and adaptability. I am looking forward to this experience, and sharing my new knowledge with my fellow Dundas Sea Cadets,” says Annie. This unique experience is open to Sea Cadets. We took on the "Mannequin Challenge"... check out the video! Did you know Sea Cadets travel to different Training Centres across Canada to learn skills of various trades, many of which can be transferrable to life and jobs in their future? The main training centre for our cadets is HMCS ONTARIO in Kingston, ON - however, depending on the cadets choice of course/trade, they may spend the summer at HMCS ACADIA in Nova Scotia, or HMCS QUADRA in British Columbia - or other local training centres in Ottawa. A cadet gets to choose what courses they take over the summer. Their first summer, they can take a 2 week General Training course, which gives them a good understanding of the various trades/courses they can specialize in the following years. The trades available are: Sailing (where a cadet achieves levels with the CYA, and can even achieve racing and instructor levels)... Seamanship (known as the real Naval trade)... Drill & Ceremonial... Sports & Fitness... Music... or Marksmanship. All of the courses are fun and challenging! And... unlike regular summer camps - cadets don't have to pay to attend these courses - they can earning training bonuses and come home with money in their pocket! After the cadets turns 16, they can apply to be a staff cadet at these training centres - and get paid with a full time job for the summer - with free room and board! So - Why haven't you joined the Dundas Sea Cadets yet? This is not a Canadian Forces website. These pages are NOT intended to be, nor do they represent in any way, official comments, statistics, or opinions of the Department of National Defence or the Navy League of Canada. These pages are NOT provided, endorsed, sponsored or approved by the Department of National Defence or the Navy League of Canada.